Not having tests in your app is a pain because, chances are every time you make slight adjustments to your app you have to manually check every single part of your app to see if anything broke. Writing tests however, also feels for the most part a chore. But we definitely need them. Why the fuss around automated testing? With automated tests you don&apos;t have to test all the workings of the app every time you change something in your enormous and still growing app. This means that when you are adding or modifying parts of your app, you will have a lot more confidence in the reliablity of your code. Which is really reassuring. Mocha is a test runner. This just means that it is a tool that runs/executes our tests. The tests themselves aren&apos;t written in Mocha. Other test runners include; Jasmine, Jest. Then add a basic test just to see how Mocha works; for now we&apos;ll use Assert as our assertion library which comes in NodeJS so no npm install needed. Yay, our test passes. What essentially happens is that the assert tests something, if the test passes it doesn&apos;t do anything; if it fails it throws an exception and this stops your tests. Just to see how a failure would look like we can change the line to something that would fail. Notice our tests stop and we get an error message telling us we have an AssertionError and what is expected. Assert, throws an error and that is how Mocha knows whether our tests are failing or passing. Note: For the entire article we wont use arrow functions. Why? You ask: Well, with Mocha you can access its context using this keyword. So, for example if you wanted to extend timeout for a test which is normally 2000ms you could do something like; this.timeout(5000). When using arrow functions, it makes this bound to the lexical context not the Mocha context. This is all to say that doing something like this.timeout(5000) won&apos;t work while using the ES6 arrow functions, along with all the other stuff you can do with this in Mocha. You can read more on this here. Chai is an assertion library. So far, we have just used Assert to make assertions and we have an idea of what asserts do. Chai, does the exact same thing but allows for better readability. SinonJS provides stand alone test spies, stubs and mocks. This is the mechanism we&apos;ll be using to create our spies, stubs and mocks. Spies: Creates fake functions which we can use to track executions. This means we can tell/ find out whether the function has been executed/ how many times its been called etc. We can also use spies on existing functions and get the same capability, to track those functions executions. We&apos;ll see this in action a bit later. Stubs: Enables us to replace functions. This gives us more control. We can return whatever we want or have our functions work in a way that suites us to be able to test multiple scenarios. Mocks: They are fake methods, that have pre-programmed behavior and pre-programmed expectations. We have a basic understanding of what these are. Let&apos;s try them out. Create a new file on your project folder; /controllers/app.controller.js. We can just instantiate req and res to empty objects and use that. This doesn&apos;t really give us anything to test or much control over the function. We could use a spy and then make some assertions on the spy. Making assertions on a spy is possible because the spy gives us a dummy function that we can use to track our functions execution. Now, when we run our tests, which we&apos;ll do by running mocha tests/**/*. * (we have to tell mocha where our tests live); we can see what res.send returns. Its basically a list of all the methods we could call to make assertions for our tests. When we run this, notice we get a failing test. This is because we expect to get an argument bla instead of Hey. We can go back to our code and replace bla with Hey and run our tests again. This way, they pass. I put this in here because sometimes its worthwhile to make your tests fail first so that you make certain that you aren&apos;t experiencing false positives. From here on feel free to fail the next tests on purpose and then make them pass, if you haven&apos;t been doing that already. From our console.log you can see, we get all the watch functionality on our already existing function. We can go ahead and make some assertions on this function just like we did before. So far, we know how to use spies; both to create dummy functions and to wrap already existing functions so that we are able to watch and test our functions. You&apos;ll find that most of the time we&apos;ll probably not use spies but they are pretty useful to test whether callbacks have been called and how many times they were called during our code execution. Spies are the simplest to use in SinonJS and most functionality is built on top of them. They are a pretty good starting point with SinonJS. We&apos;ll add a function to our app controller. Just to broaden the scope of things to test. In our /controllers/app.controller.js we can add this code. Now, in our getIndexPage function we check to see if a user isLoggedIn to send the message Hey otherwise we send another message, Ooops. You need to log in to access this page. isLoggedIn in this case is a function that does some checks to see whether current user is logged in. It could be that it checks the users&apos; jwt tokens or make direct calls to the database, we really don&apos;t have to know what the function does exactly. We&apos;ll just imagine its some expensive operation happening that either returns true when the user is logged in or false otherwise. What we did is stub out the isLoggedIn function and made it return true always for this case. The stub replaces isLoggedIn and now we can test scenarios where the user is logged in. In our case when user us logged in we expect to see the message Hey. If we run our tests now mocha tests/**/*. *, they should pass. We can also now test when the user is logged out by making our stub return false. Thats how stubs work in a nutshell. You can go crazy with them and throw specific errors and such. Check them out on the docs. Mocks is up next!! JS is inherently asynchronous. So testing async code happens pretty frequently. Let&apos;s write some async code then try testing it. It should be pretty easy. Okay, this is weird. All our tests are passing even though we know that the last test should fail. Bummer! We know why this is happening though. Think about it, Mocha is expecting an exception to be thrown but this isn&apos;t happening because the tests are running synchronously even though our function takes some time to run. So, our tests finish executing before our function gets the chance to complete. What we need, is a way to tell our tests that we are expecting something. The way we can do this is by; passing done key word in our it function. This alerts Mocha that we have to wait for done to be called. So is we add done now to our code we can see our failing test now. When we run mocha tests/**/*. * we now see our failing test!! You could go back and now fix it. We are sure that our tests are not giving us false positives now. Let&apos;s use promises for our async functions. Testing code with promises is a bit different than using callbacks. We&apos;ll need to install chai-as-promised to allow us to test our promises using Chai. We&apos;ll just use our sweetCheck function. We&apos;ll change it up a bit and use a promise instead of the callback. We are using some new assertions. These are provided by chai-as-promised. You can read up on and experiment with more of these assertions here. Notice we also do not need to use done in this case. All we need to do is return our promise and Mocha will handle it by itself. Phew! 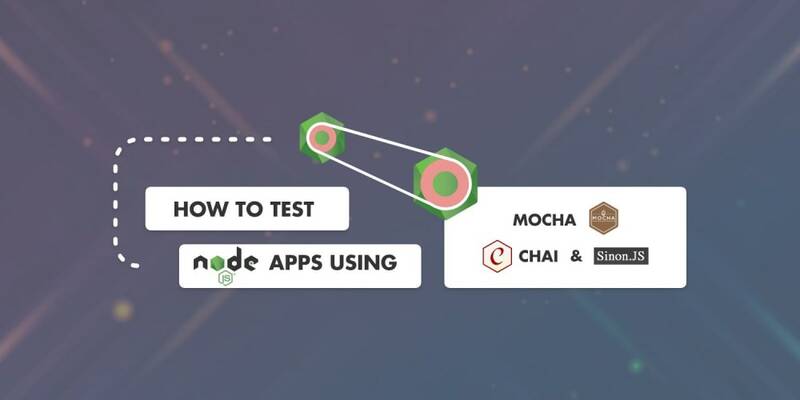 We now have all this knowledge on some useful tools we can use to test our Node Apps with. What next? Create your own app from scratch and test it. You will definitely encounter a lot more scenarios that we haven&apos;t covered yet. Feel free to post up all those questions on the comment section. If you&apos;d like to go over what we have done here on github you could use this repo to see all the different code we&apos;ve used so far. Software engineer, stationed in Nairobi, Kenya.